Saturday I was doing research on Facebook (ok wasting time if you want the truth) and I noticed a status update by my friend and fellow SBS-MVP Wayne Small pointing to HIS BLOG POST talking about a potential iPad Killer. Well I had been thinking of going over to the dark side since seeing WHS-MVP Grey Lancaster’s new iPad a couple of weeks ago. But as so many of the folks that know me have said, I have the Microsoft Kool-Aid running through my veins instead of blood and I just couldn’t bring myself to do it. Boy am I glad I waited! This baby has all the things the iPad was lacking for me, USB Ports, Mini VGA Out, Win7 Operating System and the Right Click Functionality that HA can’t live without. The more I read about the TEGA-v2 the more excited I got. Wayne was going to be bringing one to SMB Nation with him, but I couldn’t wait, so I pinged Wayne and asked him to introduce me to Hugo Ortega, Mr TEGA. I got in touch with him and ordered a sample for myself as well. If you are curious and will be at SMB Nation later this month both Wayne and I will have them with us, you can take a look at the first two to be in North America although one will be leaving with Wayne when he goes home. And if you ask us, we will have some special discount coupons while they last. You will be able to find me most of the time hanging around the GFI Software booth, stop by and take a look. 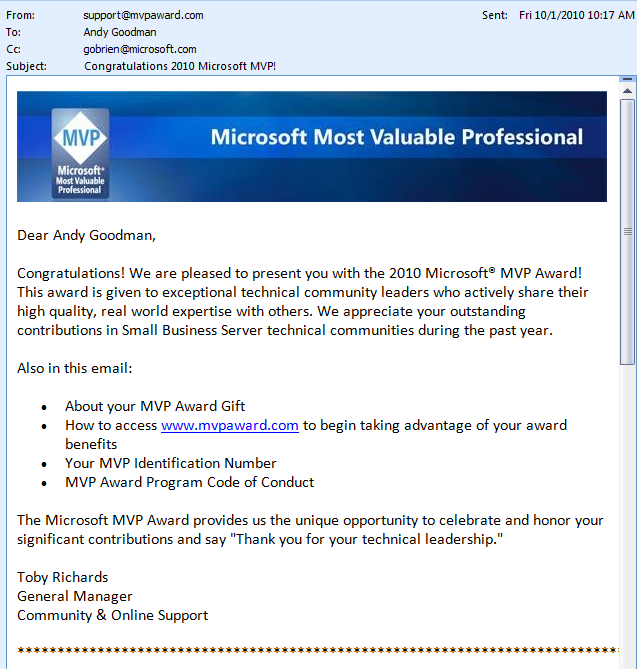 Just heard I have been awarded the Microsoft MVP for Small Business Server for the eighth year running. I would like to thank all of you that belong to the SMB Community for helping to make it something I enjoy being part of and supporting so much to enable me to qualify for this award repeatedly!